Military Diet: Lose 10 lbs in 3 Days? 3 Day Military Diet Plan, With Off Day Meal Plans, Shopping Lists & More! 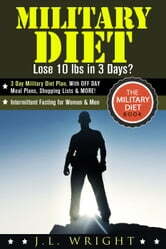 Military Diet: Lose 10 lbs in 3 Days? No special ingredient. No need to buy any product or the latest magic potion. No expensive prescriptions. No strenuous exercise. Lose up to 10 pounds each week quickly and cheaply. With drive and determination, you will be able to sail through the 3-day strict diet and burn the excess weight you’ve gained by eating too much and unhealthy eating habits. It's time to reboot your system and the Military Diet is the perfect diet plan for you! Abundant 4 Day Off Menu Plan options. No need to guess what to eat on your off days. It’s all be laid out for you. Are you Vegetarian, or require Lactose-Free or Gluten-Free foods? Well, we have you covered too, in our Military Diet Substitutions chapter. Ähnliche Bücher wie Military Diet: Lose 10 lbs in 3 Days? 3 Day Military Diet Plan, With Off Day Meal Plans, Shopping Lists & More! Pegan Diet! The Paleo Vegan Love Child! Including 100+ Pegan Diet Food List, 7 Day Pegan Diet Meal Plan, 10 Pegan Diet Recipes. Pros & Cons. Do's & Don'ts. Should You Try it? The Power of Green Smoothie: Delicious Green Smoothie That Alkalize, Cleanse, Energize and Slim Your Body in 7 Days!